Looking for craft products and gifts? Visit our dedicated crafts directory The Makers to browse an array of beautiful and functional craft products. 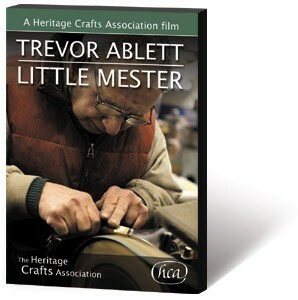 Support the Heritage Crafts Association by buying our DVDs or greetings cards. Two fortunate trainees, Ellen Wood and Tony Hassett, learn the traditional craft of gilding on the Cutty Sark in Greenwich. Master craftswoman Rachael Linton demonstrates the skills and explains the processes and techniques of oil gilding, currently classified as endangered on the HCA Red List of Endangered Crafts. This film was made with the generous support of The Worshipful Company of Goldsmiths. With special thanks to The Royal Museums of Greenwich and Campbell Smith and Co. £15 + £1.50 post and packing (UK only). Trevor Ablett was one of the last of the Sheffield cutlery industry’s ‘Little Mesters’, working up to 70 hours a week to produce high-quality pocket knives, right up to his death, in 2015, at the age of 73. The Little Mesters were involved in forging, grinding and finishing the edge tools and cutlery that Sheffield became famous for around the world. This film was made with the support of the Prince of Wales Charitable Foundation to commemorate Trevor’s life and work. £15 + £1.50 post and packing (UK only). Stanley Clark, master wooden ladder maker shows how wooden ladder are made from start to finish. £15 + £1.50 post and packing (UK only). 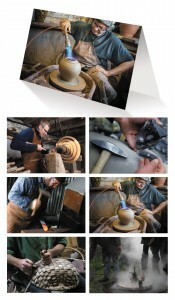 Support the Heritage Crafts Association by buying one or more packs of greetings cards promoting traditional crafts. At £10 + postage of £1.50 (UK only) the cards make a great gift and are ideal for those hard-to-buy friends and relatives. Thanks to Claire Borlase and Paul Felix for use of images on the HCA Crafts Cards. The pack of twelve cards has 2 each of 6 designs, with notes about the craft featured on the reverse. The cards are blank for your own message, are A6 in size and come with ivory envelopes. They will be sent out in a transparent plastic sleeve and then in a stout cardboard envelope. 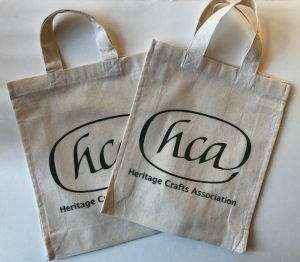 Stout natural cotton bags with short handles and a gusset, printed with the HCA logo in green, ideal for carrying light tools and books. 21 x 25 cm (5 cm gusset each side). £4 each + £1.50 post and packing (UK only).